Hong Kong (November 2014)— The May Cheong Group (MCG), manufacturers of the famous die-cast and radio control replica brands Maisto and Bburago, has announced additional details and released photos of the companies first product in the hobby‐grade replica Ferrari Signature Series line. 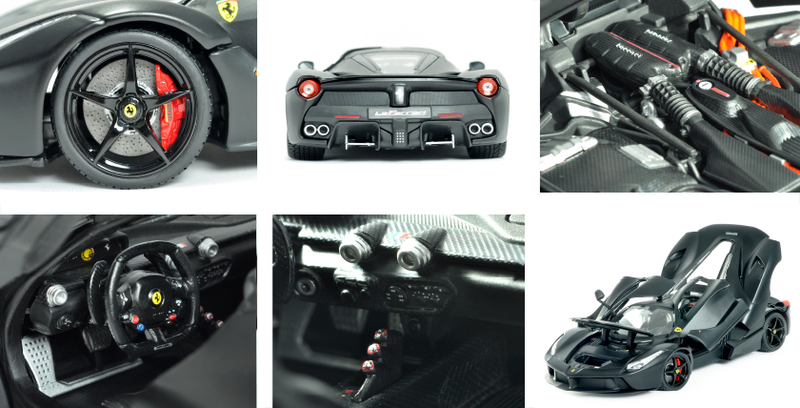 The first title they have identified is the iconic LaFerrari in 1:18 scale. Titles soon to follow are the Ferrari California T (in both open and closed top versions), and the 458 Speciale. Bburago announced there would be over 20 different enhancements to the Signature Series LaFerrari from their already highly-­‐detailed Race & Play line. Some of the variations between the 2 brands are obvious to the eye, such as the Signature Series closed, red outer box with vehicle rendering and foil-stamping branding. On the vehicle itself, the unique black-­matte color contrasts to the high-­gloss black wheels in striking fashion. Details such as the Ferrari logo over “Brembo ceramic carbon” text on the red brake calipers are harder to see but are well defined. Further details are highlighted in the photos below. More news regarding the company, including a short documentary, will be available in the Fall of 2017. The 2015 Bburago line-up includes four ranges of products within the Bburago brand - Signature Series, Racing, Race & Play, and Ferrari Kids. More than 100 cars will be launched before the end of 2015. The MAY CHEONG GROUP is a collection of affiliated companies working together to create innovative toy and replica products. The Maisto brand name was registered in 1990 by May Cheong, a vertically integrated manufacturer based in Hong Kong. The Bburago brand was acquired in 2005. MCG employs over 7,500 employees worldwide and maintains their own manufacturing facilities covering over 2,000,000 square feet. For more information, visit them at www.maisto.com, www.bburago.com, and follow them at https://www.facebook.com/BburagoCollezione, https://www.facebook.com/MaistoToys, and www.twitter.com/maistotoys.